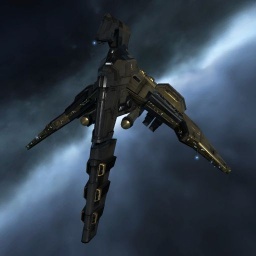 The Harpy's dual bonus to optimal range of hybrids multiply together to give a whopping 125% increase in optimal range, which combined with the innate long range of railguns allows the Harpy to shoot out to 100k with T2 rails and ammunition, which is a ludicrous range for a frigate. On the down side when rail fit it doesn't do a lot of damage even against frigates, so any enemy it fires upon will likely be able to warp away before being destroyed. The Harpy can also be blaster fit for short range high DPS, and by doing so it can apply damage at longer range than other blaster assault frigates (see Ishkur or Enyo). Although the Harpy cannot put out as much DPS as the Enyo just by looking at the numbers, it can much more easily apply its full damage to opponents thanks to its 4 mid slots, making the prop/scram/web combo (for range dictation) possible with an additional shield tanking mod. Further information about additional or recommended skills to pilot Harpy for a specific or it's common role(s) can be written here. Very slow, but has immense DPS and tank. We are giving Assault Frigates a substantial balance pass. Every AF is getting a speed boost in the form of increased max velocity and lowered mass. Every AF is also getting base capacitor numbers increased by approximately 30%. Also, we have more significant changes for the Ishkur, Retribution, and Jaguar. In February 2018, the Assault Frigate balance update introduced a new module for HACs and AFs, the Assault Damage Control, which can replace the Damage Control module for these. This page has been accessed 95,933 times.